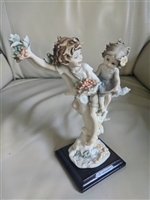 G. Armani Figurine of children with fruit made in Italy, Capodimonte. 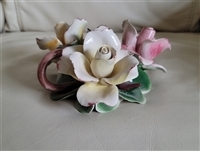 Capodimonte porcelain, blooming roses, candle holder. 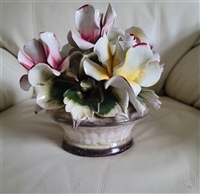 Antique Capodimonte porcelain floral candle holder, 10-1/2" long. Capodimonte porcelain vase filled with Roses. Capodimonte porcelain, Lidded Urn with Rose decor. RARE.